Shortly after we head out, we took our first bathroom break of the day at the first tea house we came across. These places are so quaint and cozy! Daily selfie in my neck warmer/head band that I bought in Chame. This piece of warmth will be essential in the days and nights to come! The inside of a smaller tea house along the trail. Thank you for letting us use your squatty potty! Thank god we bought gaiters in Chame! Today was the first day we had to trek through snow. It was only about a foot of snow, but the sun was out so we were ankle deep in slush and mud on the path. The climbing wasn't easy either- there were some very steep sections that took much longer than anticipated with all the snow. It was slippery without micro spikes, but trail gossip relayed that could buy spikes in Manang. The higher we climbed, the more incredible the views got. We were getting so close to all those huge mountains we've been seeing in the distance for the last week! When we finally reached the first town, we immediately took off our shoes and socks and laid them out to dry as we ate lunch on a roof-top deck. Since it was so sunny, they mostly dried out by the time we were finished eating. With dry socks and mostly dry shoes, we were happy (despite the devastatingly watery tomato soup we ordered for lunch). The hike after lunch to Lower Pisang was very easy- super flat with stunning views. It was very slushy, but the sun felt amazing! Every time I think it couldn't get better, it does! The Annapurna Circuit divides at this point for several miles- one can take the easy or difficult route to the next town. 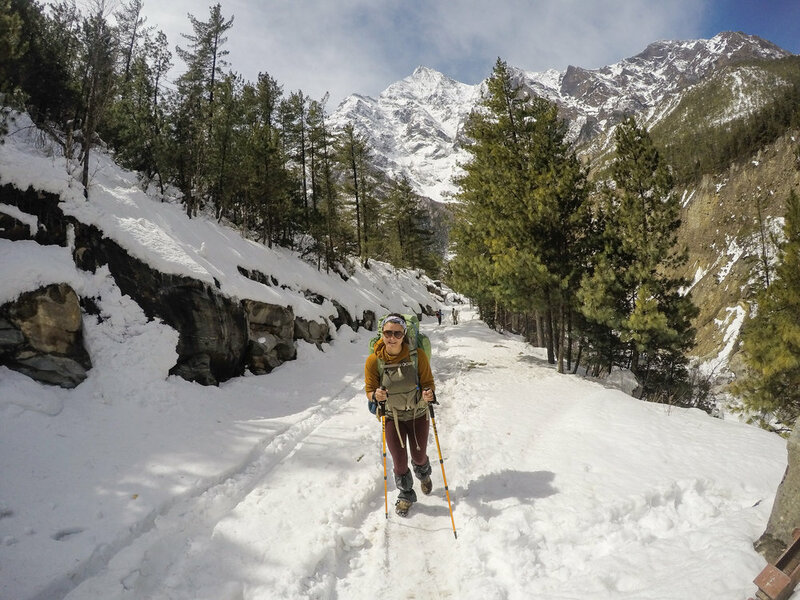 Marissa and I planned to take the more challenging and scenic route over Upper Pisang, but we heard it was far too dangerous with all the snow. The village of Upper Pisang was just across the river and about a 30 minute climb up from Lower Pisang. Since we had the time and figured the view would be infinitely better, we decided to stay the night on the mountain and climb back down the next morning to take the lower route towards Manang. We stayed at this pink and blue house on the hill and enjoyed the beautiful mountains all day. We also got free hot showers! The storms had wiped out power in most of the trail towns, leaving tea houses without wifi or hot water for showering. Now that power was finally restored, we were SO excited to get clean. I ordered a huge plate of pasta for dinner and was so so happy.